The Chihuahua is a tiny toy sized dog. The body is longer than it is tall. The head is well-rounded, apple in shape and the muzzle is short and pointed with a well-defined stop. Puppies have a soft spot on the top of the skull called a "molera," which usually closes by adulthood. The large, round eyes are set well apart and are dark, ruby, and may be lighter in white dogs. Eye color varies and are often dark, but the merle gene can produce a dog with blue eyes. The erect ears are large. Dewclaws may be removed. The tail is long, sickle-shaped and either curled over the back or to the side. The coat can be short, long and wavy or flat. All colors, both solid, marked or splashed are accepted. Colors include, but are not limited to, black, white, chestnut, fawn, sand, silver, sable, steel blue, black & tan and parti-color. The Chihuahua is a good companion dog. Courageous, extremely lively, proud and adventurous, they enjoy affection. Brave, cheerful and agile, Chihuahuas can be strong-willed without proper human leadership. They are loyal and become attached to their owners. Some like to lick their owner's faces. Socialize them well. For some, they may be slightly difficult to train, but they are intelligent, learn quickly, and respond well to proper, firm but gentle (positive reinforcement) training. May be difficult to housebreak. Do not let the Chihuahua get away with things you would not allow a large dog to do (Small Dog Syndrome), such as jumping up on humans. While it may be cute for a 5-pound tiny dog to put his paws on your leg when you come home from work, it is allowing a dominant behavior. If you allow this little dog to be your pack leader it will develop many behavior issues such as jealousy, aggression with other dogs and sometimes with humans, and will become undeniably suspicious of people except for its owner. When strangers are present, it will begin to follow its owner's every move, keeping as close as possible. A Chihuahua that is pack leader of its humans may snap at children. This breed is generally not recommended for children, not because it is not good with them, but because most people treat the Chihuahua differently than they would a large dog, causing it to become untrustworthy. Because of its size, this breed tends to be babied and things we humans clearly see as bad behavior for a large dog are looked over as cute with a small dog. Small dogs also tend to be walked less, as humans assume they get enough exercise just running around during the day. However, a walk provides more than just exercise. It provides mental stimulation and satisfies the migration instinct all dogs have. Because of this, small breeds such as the Chihuahua tend to become snappish, yappy, protective and untrustworthy with kids and humans they do not know. 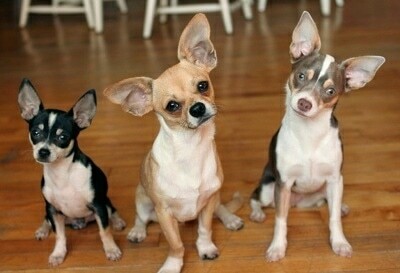 Chihuahuas that are their human's pack leader tend to be fairly dog-aggressive. An owner who realizes this and treats the Chihuahua no differently than they would a large breed, becoming a clear pack leader, will get a different, more appealing temperament out of this wonderful little dog, finding it to be a good little child companion. 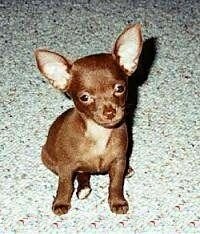 A disease that seems to be increasing among Chihuahuas is GME, which stands for Granulomatous Meningoencephalitis. It is becoming more frequent among the apple head Chis. It is, at this time, a very poorly understood central nervous system disease that suddenly strikes without much warning. It comes in three types: focal (lesions in the brain or spine); multifocal (lesions in both brain and spine as well as eyes); and optical (causing blindness. There are several current methods of treating it currently and which continue to be updated as more research is done. While there are methods of controlling it in those dogs who survive the first two weeks, unfortunately, there is no true cure. It can go into remission, sometimes for years, but can always resurface. The medications, testing, etc. in the beginning in order to properly diagnose, the cost is in the thousands and many, many more thousands will need to be spent over the remaining years of the dog's life. 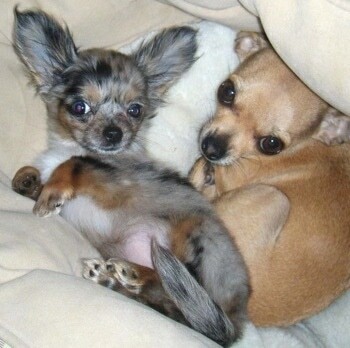 While GME occurs in many other breeds (generally the toy breeds though there are some others, there is a tremendous number of Chihuahuas with it. Interestingly, deer head Chihuahua's do not tend to be prone to GME, only the apple-head type. "We got Stoli (right) 3 years ago when we were in college back east at UNC. The first picture is her at 7 weeks old. She is a short-coat fawn with black sable. As she grew older the black sable faded and she is almost completely fawn except for the black stripe on her tail. We had to work hard to keep her from getting "small dog syndrome, " which makes many toy breeds yappy and disliked by strangers. She bonded with many friends and family members and I took her to class with me and on the bus. I even took her babysitting with me and she now LOVES kids which is not a common trait in small dogs. Because of our hard work to treat her like a dog and not a fragile little toy she is very well behaved and not terrified of people and new surroundings. She also knows over 15 tricks and loves to perform! Stoli is 3.8 pounds and almost 3 years old. Just over a month ago we decided to get a playmate for Stoli that was her own size. This first picture is Roxi at 8 weeks and 15 ounces. 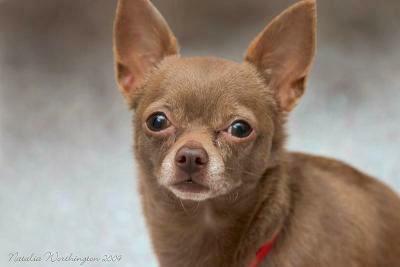 She is a longhaired Chihuahua and should get up to 3-3.5 pounds as an adult. Her full long hair will not mature until she is around 1 1/2 years old, and in the meantime she will go through "puppy uglies" which is the awkward teenager stage for long-coated breeds between their puppy and adult coats. Her color is technically black and tan with a partial white collar and white feet. She also has merle markings that give the spotted blue and black pattern to her coat. The merle gene leeches out the most of the color from the black part of her coat leaving the grey/blue areas. It has also affected her eye color, which is marbled blue and brown. The merle Chihuahua is banned from some organizations around the world, but the AKC still allows for it in the show ring. The reason for this is possible health concerns associated with the gene. But we love little Roxi to death and she is completely healthy and growing fast! Walking around town with these two we get stopped constantly to be asked what kind of dogs they are and to tell us how cute they are. Recently we have been hearing kids yell out "Mommy look they are from Beverly Hills!" due to the new Disney movie." "I have been watching Cesar Millan's shows for a couple months now and have started to use a lot of his techniques. While my puppies are still young and are a work in progress as most are, I think using these techniques will help them become balanced adults. Of course, the more I watch, the more I learn so I am also a "pack leader work in progress." My pups are already great minding as a result and as an example of that as you can see they are easily "pose-able" for photographs. :o)"
"Jasper is a 9-week-old blue merle Chihuahua weighing 1.4lbs. He's a tiny terror, but an overall good boy." 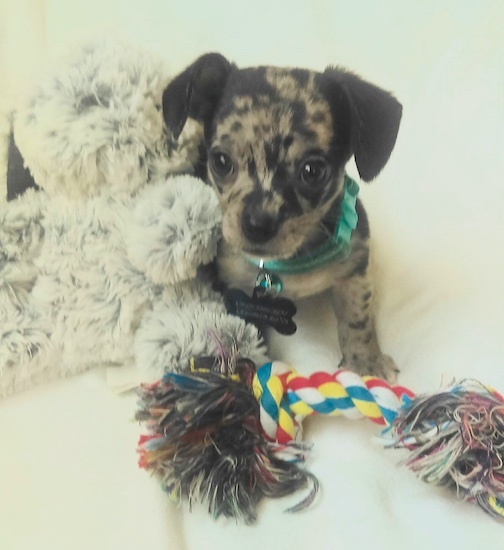 "Monkey is a 10-week-old Chihuahua. She got her name Monkey because she climbs on my shoulders all the time and adores bananas, so I thought 'Monkey' really fit her. She is very, very playful and is a joy to have. She is completely pad trained now and knows sit! She lives with 2 adults, 2 teenagers (15 and 16) and 2 little kids (7 and 11) and she loves everyone. But, is very attached to me (I'm 16). Monkey is estimated to weigh about 3 lbs. full grown. She is extremely smart and has great manners, surprisingly. Monkey is for sure a lapdog and follows me around everywhere!! Loves car rides and is very well socialized. I've watched Cesar Millan for about 3 years now and have read his book. He's amazing and has taught me so much about dog psychology, he is truly my idol. Monkey is a well-balanced dog and I taught her young not to have the mind set to walk all over me or try to control me in any way. Though she is spoiled rotten, she knows who is boss. I could not imagine my life without my little Monkey and have lots of years to look forward to. 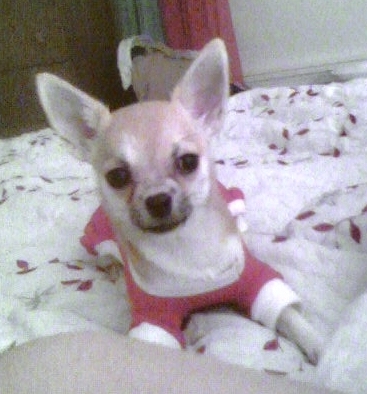 I will ONLY have Chihuahuas; they are an amazing breed and truly a joy to have!!" "This is our 8-month-old, 4.5-lb. Chihuahua Tequila. We call her Tiqi as a nickname and we love her to death. She's very energetic and I'm glad to see your site lists that they should be walked daily. Lots of people think that because she's so little, she doesn't need it, but her behavior is so much better when she's been exercised. She's very social and believes that any person she sees is there for the sole benefit of petting her. She's never learned to bark, which is fine for us. She does well with other dogs and children and is very smart! We were able to teach her to sit, shake with both her right and left paws, and 'walk pretty' in one week! This is her getting ready for bed in her PJ's." This is Boo, a shorthaired all-black Chihuahua at 1 year old, weighing 6 pounds. 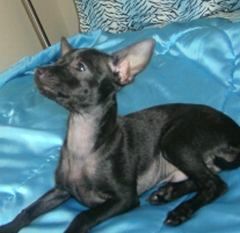 Solid black is not a very common color in the Chihuahua breed. 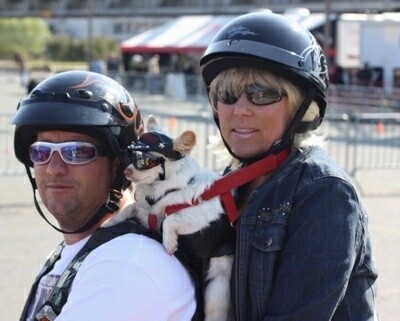 "Blondie, our Chihuahua is 9 years old and has been riding with us for 5 of those years. Blondie has ridden over 1000 miles. We take her with us on long trips. If we stop to eat she has a bag she sits in quietly while we eat (of course food is snuck into the bag for her). She is the most amazing dog I have ever owned. She loves to be with us wherever we go. I make leather riding pouches and leather outfits for dogs. I sell them at motorcycle rallies and she is a great model. The picture I'm sending in was taken by our friend we were on our way to ride the Bonnie and Clyde ride in Louisiana. My dog is a balanced dog. In fact, we watch Cesar on a regular basis. On one of his episodes he was helping a couple in California get their dog, a Jack Russell, to ride. In the beginning of that episode the dog is wearing one of my outfits that was purchased on eBay. By the way, I am a dog groomer so she gets to go to work with me every day."